Do you want to perform well on the court and impress with your emphatic plays? Always remember that the shoes that you wear while playing affects your in-game performance, and sometimes, it can either make or break a player’s career. 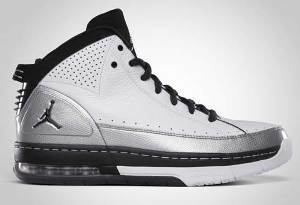 The Jordan Flight School was primarily made for performance-conscious players as it offers an exceptional comfortable feel, un-matched durability, and simple, but eye-catching design. The White/Black-Metallic Silver is set to hit strides this Holiday Season and it is expected to be one of the favorites this month so you should immediately grab one to experience wearing one of the best shoes released this year. the jordan flight school are a good pair of shoes but i have to say with all the material they used it is a heavy shoe it can get uncomfortable. I when i got the shoe i was very heavy in the beginning but I don’t recommend this shoe to someone who want to were it for style but to some one who will wear it constanly for basketball. It is a stylish and good looking shoe but it is just to heavy for a back and fourth basketball game i will slow you and make your feet uncomfortable, but all together I give it a 6.5 out of 10 making it a good shoe but not the best.